This Week’s Milk and Honey Organics Basket: Hydroponic Lettuce, Golden Pineapple, White Mushrooms, Rainbow Chard, Braeburn Apples, D’Anjou Pears, Mango, Grape Tomatoes, Carrots with Tops, Green Beans and Garlic. In the fridge: Homemade Hearty Sourdough (whole wheat + almonds + flaxseed + black and white sesame seeds + pumpkin seeds), 4 small beets, celery, carrots, apples, lemons, pears, grapefruit, parsley, cilantro, milk, yogurt, carrot juice, homemade organic cream of mushroom soup, sprouts. In the pantry: a few potatoes and yams, onions, shallots, bananas, honey, rice, tomato paste, applesauce, beans, plus stock baking items. We recently got a $50 basket instead of the normal $35 size, so I still have a good bit of stuff leftover from that. I’m looking forward to combining what we have on hand and making some fabulous dishes this week. Tonight, we had seared salmon over yellow rice, garlic cauliflower with baby bella mushrooms, and acorn squash soup. And I’ve been able to have several green smoothies recently. I think I’ll make a green smoothie with the chard, apple, and pear, and a lemon from last week for breakfast tomorrow. Hopefully, I’ll be able to share some recipes this upcoming week that we’re using. I’m definitely making the chocolate beet cupcakes again. We’re still getting used to a new schedule around the house, so the meal planning thing isn’t quite as “normal” as it was. I make sure to keep lunch meat and sliced cheese on hand for Bryan’s shift break at work. He’s been taking a sandwich on whole wheat bread with lettuce (and even added some sprouts the other day), carrots, and a banana. If he gets hungry before his shift is over, he keeps organic trail mix bars in his locker at work. I’m so proud of him for making healthful choices! It’s fun to learn about health together! We eat the dinner meal together at home, and I normally take any leftovers from that to the office for my lunch. My breakfast is normal a smoothie or some fruit and a trail mix bar or oatmeal. It’s pretty minimalistic, but it’s working for us right now. Also, I’m reading The China Study, and realizing that the choices we have made based on budget constraints (i.e., less meat, cheese, etc.) are actually healthier for us in the long run. It’s taking me a while to get through the book (heavily documented research, which I appreciate, but it’s not necessarily a quick read). I hope to share a book review on the blog in the next month. As a side note, I’m really enjoying training for my new role as Executive Assistant in the Operations Department at work. I’ll be sad when Liz leaves (the Exec. Asst. that’s training me). She’s been a good friend and I’ve enjoyed training with her these last two weeks. Tomorrow is when everything officially shifts over to me. I’m looking forward to the change. My last role hadn’t changed in four years, so I’m excited to learn new things and meet new people. I will miss my old department, but at least I’m in the same building and we can still say “hey” whenever. Moving on. Earlier this week, I posted my friend Gina’s recipe for Black Beans. This made a couple meals of beans and rice for us and we still had a good bit of leftovers. I needed to make my bread. Sourdough starter has to be fed on a regular basis; I like to make bread once a week or every other week. And we normally use 1/3 of the dough to make pizza! So, I made some whole wheat sourdough pizza crust, topped it with the prepared black beans, salsa and queso before baking. Then I sprinkled fresh organic parsley and cilantro on when it came out of the oven. It was fantastic! You’re Invited: Women’s Ministry Meeting @HBCGreer, 7PM, Tuesday, April 5th! Next Tuesday, April 5th, 2011, there will be a Ladies Only fellowship at my church, Heritage Bible Church, in Greer, SC. The event starts at 7pm (they usually last about 90 minutes). Our church holds these special functions quarterly for ladies only! It’s a night to get out, enjoy fellowship with other women, learn, and have fun. Next week’s theme is Health & Wellness! The evening will begin with a personal testimony and challenge by Katie Gerdt (I’ve shared a few of her devotionals on my blog before). Then we’ll have a break with healthful snacks. And we’ll conclude the evening with a panel discussion (yes, you can submit questions). They’ve asked me to sit on the panel as the “Fitness” side of things. I am humbled by this opportunity and very excited to share what the Lord has taught me in my journey over the past few years. Other panelists, Lord-willing, will be a Registered Dietician, a Healthy Mom with young kids, a Healthy Mom with teens (who happens to have a Bachelors in Physical Education), and maybe a woman who is in a later stage of life who has learned to cope with various physical challenges. The Holy Bible, first and foremost resource for EVERY aspect of life, including health and fitness. The China Study: Startling Implications for Diet, Weight Loss and Long-Term Health, by T. Colin Campbell, PhD, and Thomas M. Campbell II. Food, Fitness, and Faith for Women: A 21 Day Journey to a New You, by Freeman-Smith. Good Carbs, Bad Carbs, Johanna Burani, M.S., R.D., C.S.E. In Defense of Food: An Eater’s Manifesto, by Michael Pollan. Organizing Your Private World, by George MacDonald. Reasonably Thin: The Spiritual Aspects of Over and Undereating, by Jesse Dillinger. Will Medicine Stop the Pain? by Elyse Fitzpatrick and Dr. Laura Hendrickson. Women’s Health Total Fitness 2010 (there’s one for each year, they also have one for Men’s Health). Yoga Daily Exercises: A 7-day Program to Harmonize the Body and Soul, published by Parragon Books Ltd.
Betty Crocker’s Healthy New Choices. Simply Organic: A Cookbook for Sustainable, Seasonal, and Local Ingredients, by Jesse Ziff Cool. The Biggest Loser Workout DVDs: Cardio Max, Weight Loss Yoga, Boot Camp, etc. Obviously, I don’t endorse everything from any one resource (except the Bible), but these are some things that have been helpful in my journey towards a healthier lifestyle. Simple Living Media Network of Blogs = Amazing! I came across this network of blogs when I was looking for a recipe online last week. It’s fabulous! Click on each link below for the various blogs. There’s a section for Moms: Simple Mom. There’s a section for Kids: Simple Kids. There’s a section for food: Simple Bites. There’s a section on Organics: Simple Organic. And there’s a section on Homeschooling: Simple Homeschool. Thank you to my friend Gina for providing these delicious recipes! Gina and I met at church and quickly became friends when we realized we were both on a journey towards healthy living. She’s also the friend I call when I have any kind of gardening question! We spent Sunday afternoon at their house after church a few months ago, and this is the meal she served. It was so yummy that I asked her to share it for the blog. It’s a cold, rainy day here, and Bryan sleeps during the day since he’s on 3rd shift, so it’s quiet too. I wanted some comfort food, so I made the black beans for dinner. They’re simmering on the stove as I write this. They smell so good! I only used 1 c. of dried beans (which is about 1/4 lb.). I did the fast soak method (see below) and they turned into 2.5 c. So, I basically used 1/4 of the recipe below. Also, I reduced the oil to about 1-2 Tbsp. Gina and her husband Chad created this recipe by experimenting until they matched the flavors of a dish she remembered from years ago. “Start with 1 lb. dry black beans. Wash them, cover with 5 cups of water and then soak overnight OR bring to a boil, boil for 2 minutes, cover and let stand (without heat) for 1 hour. I did the “fast” method because I never think about it the night before. “Drain and rinse the beans and put them back into the pot. Add fresh water to 2 inches above the beans. Salt the water and bring it to a boil. Reduce heat and simmer until tender, anywhere from 40 minutes to an hour. “In a saute pan, heat 1 cup olive oil. Add 2 finely chopped onions, 12 finely chopped cloves garlic (yes, I said twelve), salt, pepper, 2 bay leaves, 2 teaspoons smoked paprika (not regular paprika, SMOKED), and some cumin. Saute for a few minutes and then cook it for about 10 minutes, stirring occasionally. “Drain 1-2 cups of beans (I started with 1 and it wasn’t enough, so I added more…) and add to the onion mixture. Mash the entire mixture thoroughly, so it’s like a paste. (I use a fork.) Stir in 2-3 Tbsp. sugar and 1 tsp. dry oregano. “Add the onion mixture to the bean pot. Cover and simmer for an hour or more if it seems like they aren’t done. Happy Birthday, My Journey to Lean! ...and thanks to Dan & Kirsten for these delicious (from scratch) strawberry cupcakes with homemade cream cheese frosting! I would love it if you would tell me about your journey in the comments section! Who knows, maybe you’ll be my next interview or guest blogger. Backyard Chicken Chat @ Furman This Saturday – and Where to Get Your Chicks! Some day, I want to own and operate an organic Bed & Breakfast on about 3-10 acres of land with a mountain view, maybe even my own pond that I can stock fish in. I want to have a coffee-and-tea shop at the front, on three to ten acres of land, and grow my own vegetables, have fruit trees, and raise my own chickens. If you find yourself dreaming of things like this, you might be interested in The Backyard Chicken Chat this Saturday, March 26, at Furman University in Greenville, SC. Order tickets online for about $10 off the at-the-door price by clicking the logo below. “edible UPCOUNTRY magazine and Furman University’s David E. Shi Center for Sustainability will hold a workshop on the fundamentals of backyard chicken keeping on Saturday, March 26 from 8:30 a.m. to noon at the McEachern Lecture Hall on the Furman campus. ““The Great Backyard Chicken Chat!” advance tickets* can be purchased online for $15 (plus small transaction fee). Tickets at the door are $25 (cash/check only), space available. “The “Backyard Chicken Keeping 101” workshop promises to answer questions about types of breeds, coops, feed and more. An introductory workshop will be given by globally acclaimed poultry expert Jim Adkins of the International Centre for Poultry. “Following Adkins’ talk will be a panel discussion by Upstate chicken keepers who are successfully raising flocks large and small. The panel will be led by Rebecca McKinney, local Master Gardener, backyard bird lover and co-founder of Growing Up Green Organics, LLC, anurban farm, training center and edible landscaping company. Panelists include edibleUPCOUNTRY contributors, Mary E. Miller and architect Jennifer Gosnell. Clemson Student Organic Farm Manager Shawn Jadrnicek will have a seat on the panel as well as Sylglenda Saziru of John Smith’s Hill Farm in Spartanburg and Chris Noel of Limestone Farms in Greer. And, if you’re really interested in this, there are chickens and turkeys, bantams and ducks at TSC (Tractor Supply Co., or as my dad calls it, “THE Store Company”). Chicks are available March 2 through May 27! They’re so cute! Also, check out Made From Scratch by Jenna Woginrich for great tips from someone who started with a few chicks on her apartment’s back porch and ended up buying a farm! Huge “Simplify Your Family Life” eBook Sale: Limited Time Only! Sale Ends March 25th at 2pm EST (even though the picture says March 21-24). 30 books for $47 – almost 90% off regular prices ($453.17 value). Purchase here. Download the PDFs and read them on your computer, eReader, iPad/iPhone, etc. A portion of all proceeds go to The Mentoring Project (founded by author Donald Miller) that helps kids without dads. We got a bundle of beets in our produce basket this week, and while I love them roasted and chopped in a salad or sauteed in butter and garlic, my husband’s not a huge fan. I saw a recipe for Chocolate Cupcakes made with Beets on an episode of Good Morning America Health several months ago and have been waiting for a chance to try it. So, when I saw we were getting beets in our basket, I started looking for recipes and came across this one from Simple Bites. 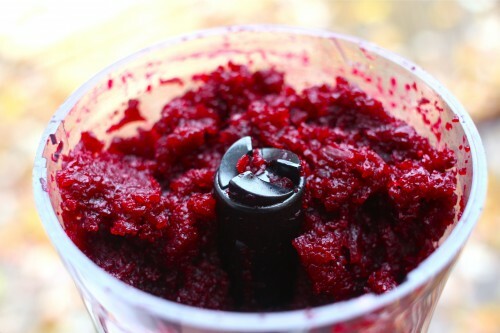 The beets give it a deep dark color, almost like Red Velvet cake, while keeping the cupcakes moist and semi-nutritious. These were a definite win for kids and adults alike! Declan's too little for cupcakes, but we had some leftover organic beet puree, so Julie mixed it in his organic rice cereal and he loved it! 1. Line a 12-cup muffin tin with cupcake papers. Preheat oven to 350°F. 3. Whisk together flour, baking powder, baking soda and salt. 4. In the bowl of a stand mixer, using the paddle attachment, beat remaining butter and sugar together until well combined. Scrape down the sides often. Beat in egg and vanilla. Beat in beet purée, followed by melted chocolate mixture. 5. Remove paddle attachment, and using a sturdy spatula, fold in flour mixture by hand. Do not over mix. 6. Using a lever ice cream scoop to make the job easier and mess-free, divide cupcake batter among muffin cups. 7. Bake until a toothpick inserted in the center comes out clean, about 25 minutes. Cool in tins for a few minutes, then cool cupcakes completely on a wire rack. Looks like Chocolate Cupcakes to me! “This rich frosting is the decadent touch that really puts these cupcakes over the top. If you don’t have maple syrup, a half a cup of powdered sugar and a few drops of milk will work as well. With an electric mixer, beat together cream cheese and butter until smooth. Add maple syrup and a pinch of salt and beat again until smooth. After they cool, top with a dollop of frosting and sprinkle with shaved dark chocolate. We let ours cool on a wired rack, then put them back in the pan to easily transport outside for dessert. This picture doesn't do justice. Every time her mommy pulled the cupcake away from her mouth, Kate would jump up and down and squeal for more! Will wiped off the icing but gobbled up the cupcake. Isaac and Will are two and have no idea they're eating vegetables! So cute! We made this recipe from Sprouted Kitchen and they were a big hit! I’ll have to try it with potatos sometime. Thanks to my sister-in-law Julie for taking pictures while I was cooking! I loved these and the kids called them “fries” and gobbled them right up! 1. Line a baking sheet with parchment paper or foil and either spray or give it a rub of butter. 2. Cut the parsnips into wedges or halves depending on the thickness. Since they taper so much, I used the ends whole then cut the fat top into fourths. Try to get them as evenly sized as possible. 3. In a large bowl, beat the egg whites til frothy with 2 tsp dried oregano. 4. Working with about half of the parsnips at a time, toss in the egg white and then gently roll in the parmesan cheese. Place each parsnip on the baking sheet, with space in between. Sprinkle the fresh rosemary and generous amounts of fresh pepper and salt. You may even want to give one more sprinkling of parmesan, you want them pretty well doused. 5. Bake the wedges about 20-25 minutes until crispy and cooked through. Rotate and test them after 15 minutes baking as the size of parsnips will vary. I did not line with sheet pan. I generously sprayed it with olive oil. Dip parsnips in egg whites and roll in cheese. Sprinkle with Fresh Herbs and roast at 425F for 15 minutes, flip, and roast for 10-15 more minutes, till golden brown.